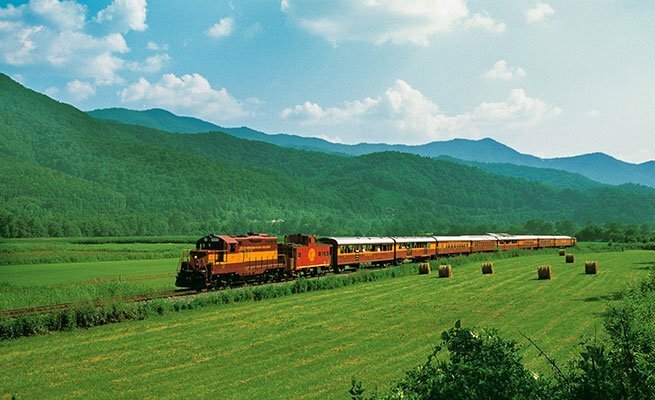 Hop aboard the Great Smoky Mountains Railroad in Bryson City, NC for a scenic train ride through the smokies. You’ll enjoy views of Great Smoky Mountains National Park and sparkling mountain streams. 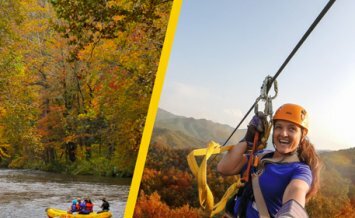 Our favorite trip, The Nantahala Gorge Excursion, spends an hour layover here at Nantahala Outdoor Center with scenic views of the Nantahala River. 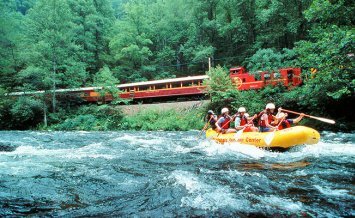 Add some adventure to the ride with NOC’s Rapid Transit trip: a Nantahala Gorge Excursion packaged with lunch and a fully-guided whitewater rafting trip on the exciting Nantahala River. Transportation back to Bryson City included. Interested in seeing a new river? Join the Tuckaseegee Gorge Excursion for a 4 hour round trip ride. 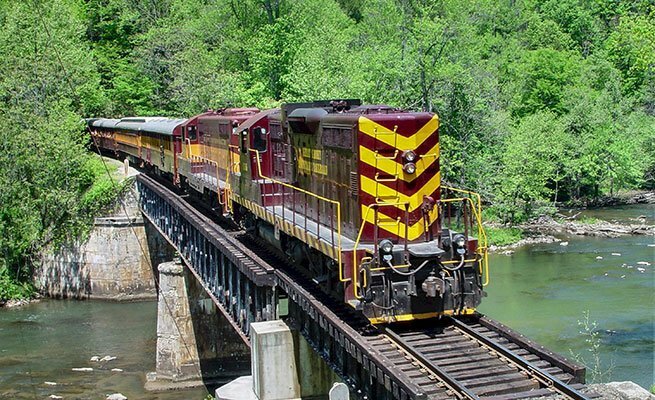 This relaxing trip departs from Bryson City and winds its way across the Tuckaseegee River to historic Dillsboro. 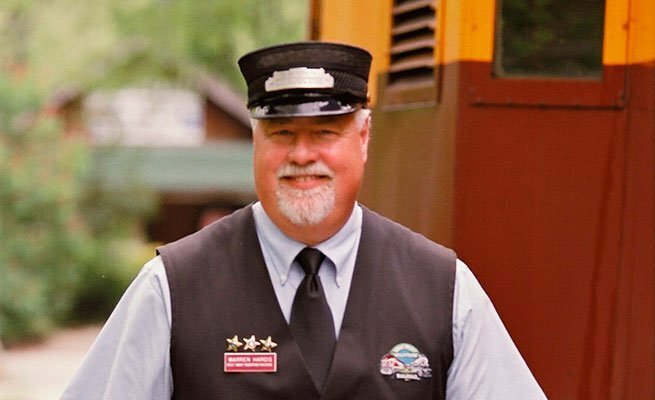 Don't delay, book your Great Smoky Mountain Railroad tickets online today! The Rapid Transit and Great Smoky Mountains Railroad excursions meet and depart from the Great Smoky Mountains Railroad Depot (GSMR) in Bryson City, NC. 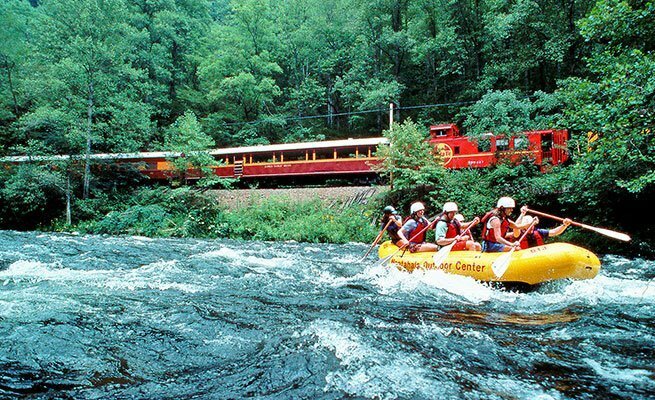 Even if you are rafting the Nantahala, all train trips meet and depart from Bryson City. Transportation is provided back to Bryson City after your rafting trip. From Asheville, NC: Take I-40 W towards Knoxville, TN. Take exit 27 onto US 74 W towards Waynesville. Continue on US 74 for 40-miles until you reach exit 67 for Bryson City. Keep right at the end of the exit ramp onto Veterans Blvd. At the first traffic light turn right onto Main Street. Take a left onto Everett Street at the next traffic light. Turn left onto Mitchell Street. Parking for Rapid Transit will be on your right. From West Atlanta: Take I-75 N to I-575 N which becomes State Hwy 5 and then Hwy 76. Past Blue Ridge, GA turn left onto Hwy 60 to Mineral Bluff, GA. In Mineral Bluff turn right onto Hwy 60 Spur. You will enter North Carolina. When the road ends take a right towards Murphy and Andrews on US 74 E. Drive through the Nantahala Gorge, passing the Nantahala River as well as the NOC Nantahala Outpost. 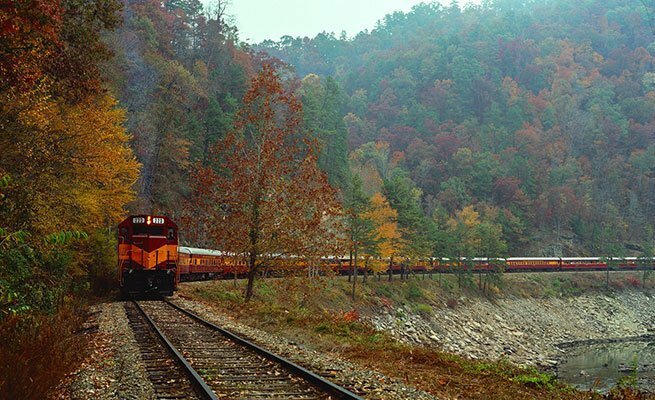 Continue, you will meet at the Depot in Bryson City, not at the river. Take exit 67 for Bryson City. Turn left onto Veterans Blvd. At the first traffic light turn right onto Main Street. Take a left onto Everett Street at the next traffic light. Turn left onto Mitchell Street. Parking for Rapid Transit will be on your right. From East Atlanta: Take I-85 N to I-985 N. In Gainesville take 365 N to 441 N into North Carolina. Near Dillsboro, US 441 merges with US 74 W. Stay on 74 until you reach Bryson City exit 67. Bear right at the end of the exit ramp onto Veterans Blvd. At the first traffic light turn right onto Main Street. Take a left onto Everett Street at the next traffic light. Turn left onto Mitchell Street. Parking for Rapid Transit will be on your right. From Chattanooga, TN: Take I-75 N towards Cleveland. Take the first Cleveland exit (exit 20) onto Us 64 Bypass E. Continue 6 miles then take the Ocoee/Murphy exit US 64. Cross into North Carolina. In Murphy the road number changes to US 74. 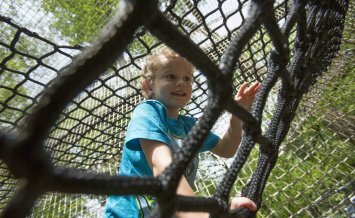 Drive through the Nantahala Gorge, passing the Nantahala River as well as the NOC Nantahala Outpost. 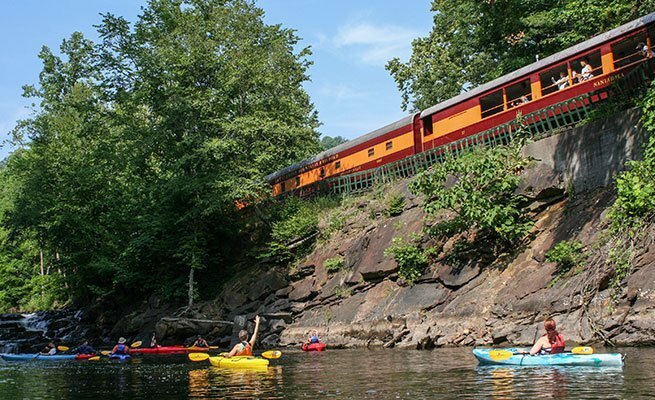 Continue, you will meet at the Depot in Bryson City, not at the river. Take exit 67 for Bryson City. Turn left onto Veterans Blvd. At the first traffic light turn right onto Main Street. Take a left onto Everett Street at the next traffic light. Turn left onto Mitchell Street. Parking for Rapid Transit will be on your right.